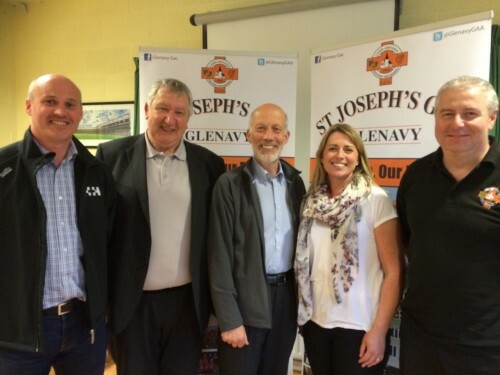 H+H are thrilled to announce the imminent commencement of a £100,000.00 enhancement to St Joseph’s GAC, Glenavy. H+H designed the inclusion of a new walking trail around the club grounds to enhance local health and well-being opportunities. The club are also carrying out a major rejuvenation of their main pitch playing surface and team dugout facilities at this time. 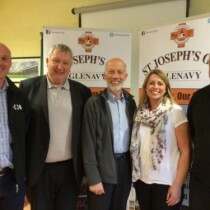 Ciaran is pictured explaining the proposals to Justice Minister David Forde along with Club Chairman Joe O’Boyle and Development Committee Members John McGrade and Frances O’Neill. Works should be completed by September 2015 to allow pitch opening by February 2016. Further images showing the progression of this project can be viewed here.